There’s no need to worry if you haven’t gotten an Advent calendar yet because I’ve rounded up 10 fabulous Advent calendars that you can print from home TODAY. Even if all you have is a black and white printer, you’re in luck! Keep reading to find a calendar you like, then get out your scissors and glue stick and make one (or more) of these amazing Advent calendars. 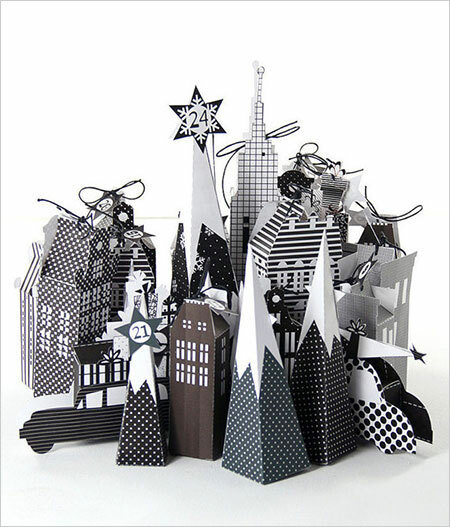 Build a cityscape with the various boxes in this printable Advent calendar. 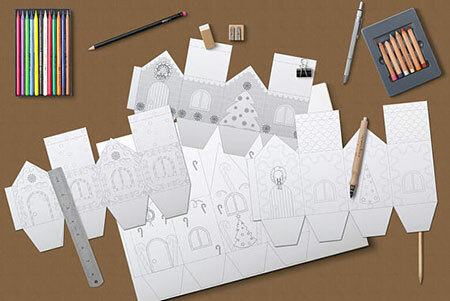 Monochromatic and modern, this calendar has a Scandinavian feel to it. The calendar contains three cars, three different trees, a Christmas tree, seven houses, a skyscraper, and numbered stars. 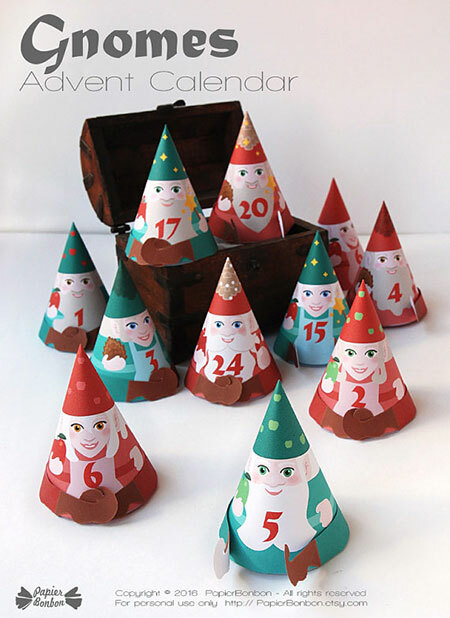 Customize your Advent calendar by printing multiples of your favorite boxes. Personalize it by adding hand drawn elements, such as stick figures of your family members in the car windows. 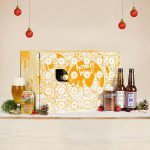 This festive Advent calendar bursts with Christmas goodness! The printable PDF comes with two reindeer, a sleigh, thirteen different sized boxes, name tags, and number tags. 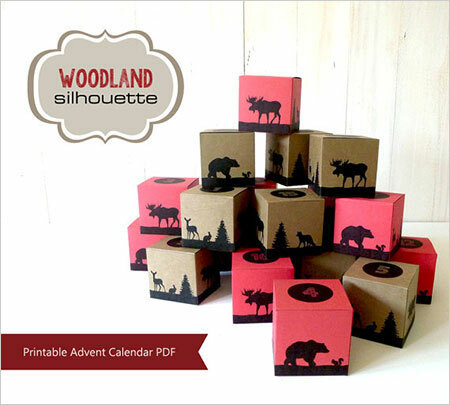 Simply print as many reindeer and gift boxes as you like to complete your Advent calendar. Now the question is, will your sleigh be drawn by two or eight reindeer? Impress your family and friends with an igloo Advent calendar! The igloo itself is the calendar, comprised of 26 little boxes. 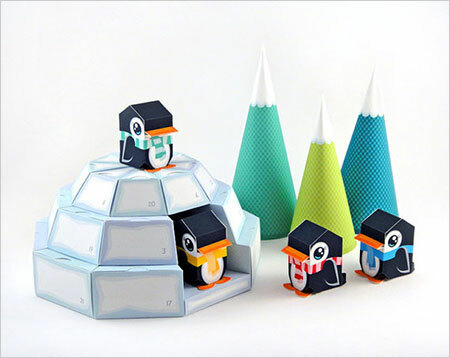 Also included in the PDF download are penguins and trees, which will complete your winter scene. When you’re done assembling your calendar, put it on display for all to see! 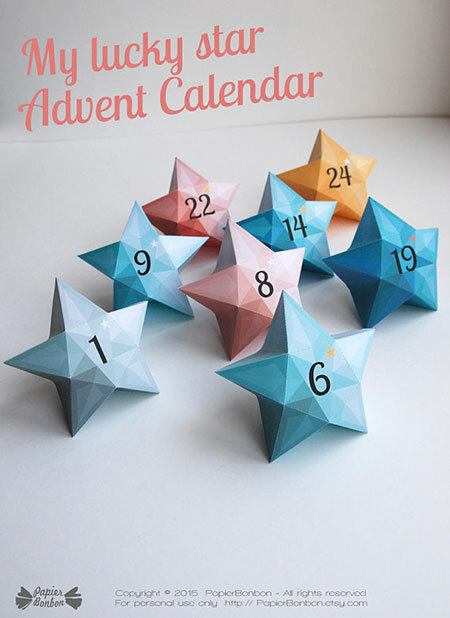 Download this Advent calendar and soon you’ll have twenty-four star-shaped boxes in hues of blue and coral. If you’d like a helping hand assembling your calendar, check out this video tutorial by the folks at Papier Bonbon. When you’re done cutting, folding, and gluing, these little gems will be ready for treats to be tucked inside. 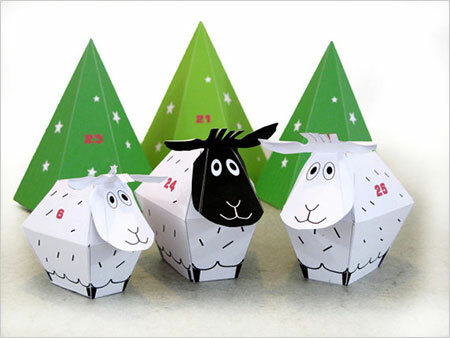 Count down the days to Christmas with the adorable sheep in this printable Advent calendar. These charming critters will complement one’s woodland Christmas decor. Simply place the sheep on a shelf or add strings to hang them on your Christmas tree. By simply changing the color of your paper, you can customize this Advent calendar, as the printable files include only black shapes. (Hint: All you need is a black and white printer!) The boxes shown here are printed on red and brown paper yielding a rustic holiday look, but you can print on any colored (or patterned) paper you like. Perhaps shades of green for a forest theme or blues and whites for a wintery look. 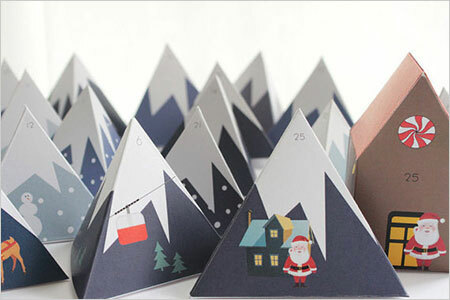 Each mountain-shaped box in this Advent calendar features a whimsical winter design that differs from the others in the set. 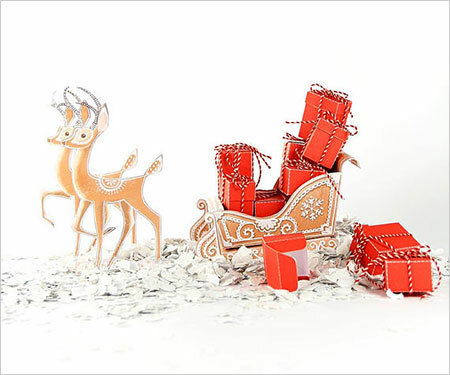 The box with the airlift and the box with the reindeer are especially cute! And with two options for December 25th—Santa on a mountain shaped box or Santa on a gingerbread house box—you may have a hard time deciding which one to use! 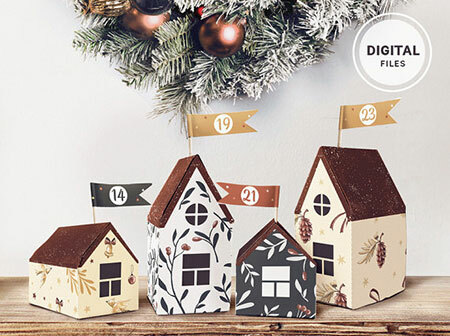 This charming Advent calendar features seven different houses, each covered with pretty holiday elements, such as mistletoe, pinecones, and more. In addition to various village buildings, this printable calendar includes date flags and tags for each day in December. Gather your kids around the table for some family time as you all color this gingerbread house Advent calendar. Print one calendar for the whole family to share or print one for each child. Once the calendar(s) are decorated, assemble the boxes and fill with treats.